There was some pretty good Chardonnay knocking around from the 2014 harvest , this one from Hush Heath is right up there . Unlike the rather austere 2013 the 2014 is made from the lower yielding burgundian clones planted in 2011 in the Middle Strackney Wood vineyard . Picking took place around the 17th of October with sugars of about 10.5 % natural . A very cool and prolonged ferment ( well into the new year) and extended time on yeast . Benefiting from the complete absence of oak and unhurried bottling . Far too cheap at £16 . It won’t last long. Skye’s English Chardonnay 2104 – pale white gold with green highlights . Clean, citrus, thyme on the nose, well balanced backbone of crisp acidity, ripe rich fruit , citrus, grapefruit, apple, complex salty and herby finish . look out Chablis ? More to follow on Chardonnays from Kingscote , Nutbourne and Highdown 2014s awaiting release. 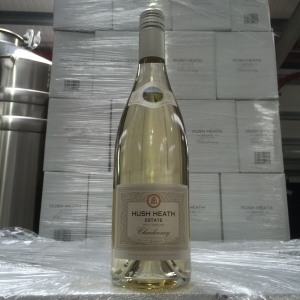 A unique wine was bottled today at Hush Heath. The sparkling wine is made from six of the grape varieties allowed in Champagne. As well as the classic trio of Chardonnay, Pinot Noir and Pinot Meunier this assemblage includes Arbane, Petite Mesilier and Pinot Blanc, together they make up 35% of the blend which all comes from the Middle Strackney Wood vineyard on the Kent estate. It tastes quite different to a traditional blend, more fragrant perhaps? 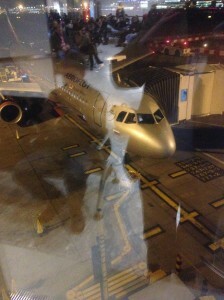 Anyway the proof will be in the drinking – maybe this time next year? As flowering and Wimbledon approach , we look forward to 2015 but before that a quick look back to 2014. 2014 goes down as one of the wettest and warmest years in England ever. Bud-burst was as early as April 2nd for Chardonnay and Rondo here in Kent. This year (2015) it was around the 15th . Spring frosts were not an issue , the frost pots were fired up twice at Hush Heath more as a precaution than in earnest. Flowering was prolific and early starting well before Wimbledon , set was good and it became obvious at this point that there was potential for a very large crop(7t/a+) Interestingly there was a widespread failure in some older GDC vines to produce anything more than a smattering of rather feeble flowers, not quite sure why, possibly low potential from the previous year. The year continued warm but damp with high disease pressure catching out quite a few growers with Downey and Powdery mildew causing considerable losses up to 50% + and allowing a foot hold for Botrytis . The size of the crop was beginning to cause problems for growers who had not green harvested or leaf plucked . The weight of the crop meant that the vines struggled to ripen in spite of the warmth and early start. The un -even ripeness problem was most acute in the later ripening sparkling varieties Chardonnay and Pinots , particularly as botrytis threatened . Growers were left with the expensive options of selective picking or picking at barley acceptable low sugars and high acids , or risking botrytis and forlorn hope that a large crop would ripen in the last weeks of October . In the end I would be surprised if half the potential crop in England was actually harvested . Coming soon to a Pub near you is the latest cider created for Hush Heath. 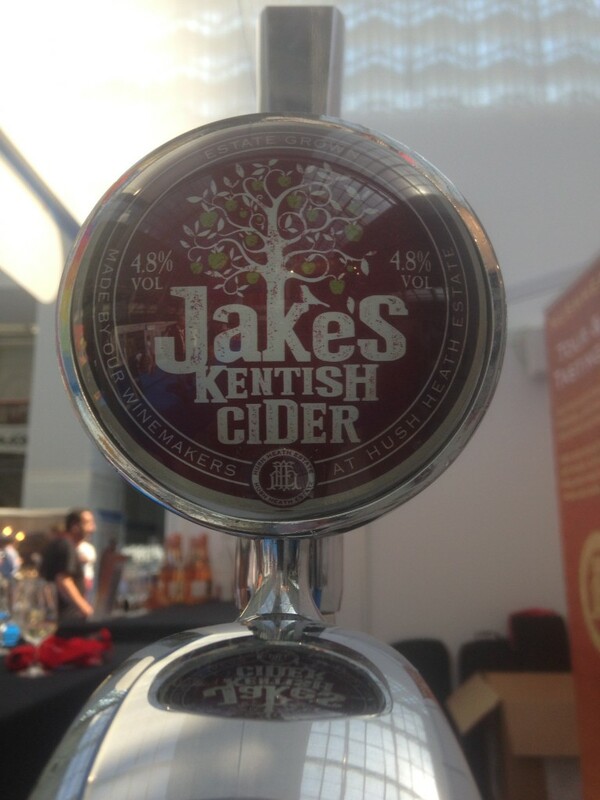 Jake’S Kentish cider is made from the trio of Kent apples,Cox, Egremont Russet and Bramley all grown on the Hush Heath Estate. As you can expect the cider is wine like in its purity and taste. Made using modern wine making techniques, wine yeasts,temperature control and stainless steel for something quite different, and for traditional cider drinkers quite unexpected . The cider is not pasteurised, but sterile filtered to maintain its freshness. The cider has an ABV of 4.8% and is currently available in 1 way kegs , a 500 ml bottle version will be out and about by the end of August . The cider is being distributed by Cave Direct (info@cavedirect.com). At the moment it can be sampledon draught at The Vine in Goudhurst , The Bull – Devonshire Row and St Barts Brewery – Smithfield. 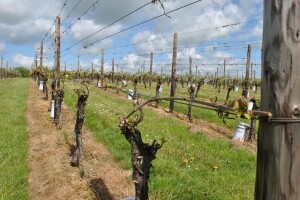 A wet and comparatively mild spring has led to and early bud burst this year, Rondo and Chardonnay led the way in the South East on the 2nd of April.Pinot Noir and Bacchus followed a few days later. Pinot Blanc burst on April 2nd in West Sussex and over 7days later in Kent. There has been a fair amount of die back in some recent plantings almost certainly due to the sodden year. There seems to be fair proportion of blind buds across most varietals. Frost has been at the forefront of mosts growers minds . The burners have been fired 3 times this year at Hush Heath and have done their job. Temperatures were not too extreme and most growers in the South East have escaped quite lightly. 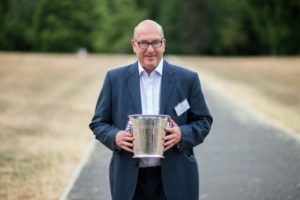 Engish Terroir has created a new range of Still and Bottle-fermented cider at Hush Heath.Made from apples grown on the Estate and vinified and bottled at the Winery. 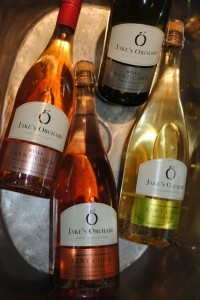 The ciders are made from pure apple juice , cool fermented in Stainless steel for a wine like character. Bottled in 75 cl bottles and marketed under the Jake’s Tree label. The exciting thing about vintage wines, such as the Balfour, are the way they evolve and reveal and reflect the vintage year. The 2009 Balfour Brut is now in wider circulation after a brief Silver Medal showing at last years Olympics. 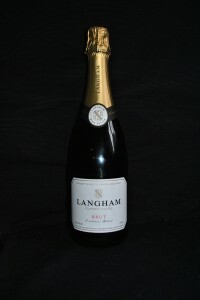 The 2009 harvest itself took place over 2 days , on the 11th and 12th of October at Hush Heath. Unusually the Chardonnay was earlier than the Pinots with higher sugar (81 oc ) and lower acid (10.6g/l) . The Pinot Noir and Meunier came in at 77 oc and 11.6 g/l , pretty well perfect in other words. The winemaking followed the usual course, cool separate ferments with a short 6 day separate red ferment for the Pinot Meunier . The final blend worked out at 52% Pinot Noir, 37% Chardonnay and 11% Pinot Mernier, a somewhat higher proportion than usual and a rather deeper pink . 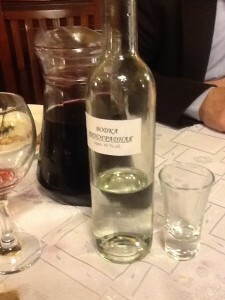 The wine was bottled in July 2010. 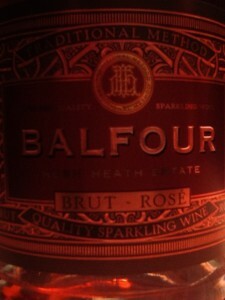 From its comparativly youthful beginnings 2009 Balfour Brut is now a wine showing itself in its finest condition. The wine has now been on its lees for over 2 1/2 years . 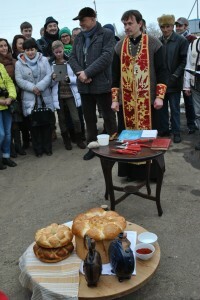 The wine was selected for the Olympics and the ffirst batch was disgorged in March 2012. Since then it has been disgorged on demand at the Hush Heath Winery, giving 3 months on the cork before sale. A deeper pink than previous vintages, reflecting the higher proprotion of Mernier. The bead is fine and sustained both in the glass and mouth. The nose is slightly creamy,hints of white pepper, dried herbs. The palate is gloriously complex and full, malted shortbread,orange citrus, cooked strawberry and white chocolate . It finishes freshly and long, raspberries and cream.